Halloween is on 31st October and we are already sending out orders for this fun day. We have been looking at lots of Halloween Party Ideas to help you plan the perfect Halloween Themed Party. Halloween Decorations are a great way to start, whether you are having a party or decorating your home for trick or treating. 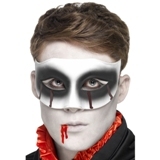 No Halloween would be complete without Halloween Fancy Dress Costumes and we loads to choose from to add to a fantastic Halloween Theme. We would love to hear from you as to how you are celebrating Halloween this year. Halloween will soon be upon us and we already busy sending out orders of loads of Halloween Party Products including Halloween Fancy Dress Costumes and Halloween Decorations all perfect for a Halloween Theme. Halloween is on 31st October and is celebrated in many countries. It was also known as All Hallows’ Eve and All Saints Eve. There are many Halloween traditions which are enjoyed by both adults and children either at a Halloween Party, out Trick or Treating with friends or decorating your home to get into the spirit of the day. Orange and Black are typical colours of Halloween and are used in lots of Halloween Party Supplies. We have lots of Halloween Ideas to help you go to town this year with all of your Halloween celebrations. Our Halloween Decorations are perfect for a fantastic Halloween full of atmosphere. A Hanging Honeycomb Witch Decoration, Halloween Cutouts, Bat Hanging Whirls, Body Part Cutouts and a Hanging Skeleton are just a selection of the cool decorations available. Spider Decorations are a great choice and include a Hanging Glitter Decoration and a Spiders Web. Pumpkin Decorations are always popular and our range includes Carved Pumpkin Cutout Decorations and an Inflatable Pumpkin. Our Ghost Decorations are really spooky and the Paper Garland Hanging Ghosts look really effective. Happy Halloween Glitter and Jointed Halloween Banners are ideal to put up at any venue as are a Haunted House Halloween Bunting and a Spiders Web Pennant. Halloween Decoration Packs are available in Standard or Large Sizes and make shopping effortless. No Halloween Theme would be complete without Fancy Dress and we have lots of options to select. A Devil Lady Costume and Devil Man Costume are impressive matching Adult’s Halloween Costumes and a Pumpkin Witch and Skeleton are a great option for Children’s Halloween Costumes. Witch’s Hats are very distinctive for Halloween and you will look the part in a Black Velour Hat with a Hanging Spider or a Shiny Witch Hat. Halloween Make up and Halloween Face and Body Paint will also add to the magic of Halloween and create an amazing impact. How are you spending Halloween? Are you having a Halloween Party? We would love to hear from you.